Can I play movies from a USB drive on my PlayStation4? Referring to the topic of us.playstation.com about playing videos on PS4 from USB flash drive, you may got some solutions to solve this problem, which is the effective one? In this guide I will share my view with you and propose two easy solutions to play movies from a USB drive on PlayStation4. PS4 Media Player supports more file types than the PS3 application, which is great but was honestly not a difficult record to break. PS4 Media Player supports the following file types, according to the documentation. Okay guys, how it works? 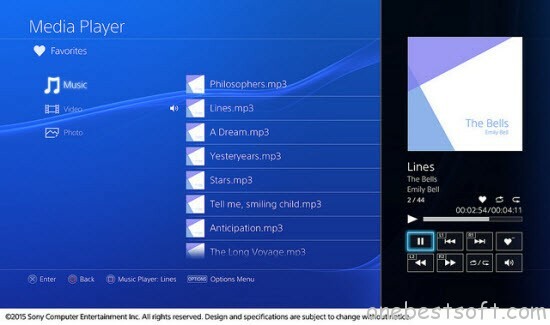 The PS4 Media Player button should show up directly on your PS4 screen. If it doesn’t, search for “Media Player” in the PSN store. The download is pretty straightforward (just like any other app on the PS4). Once installed, you will need to connect either a USB storage, or have a Media Server up and running on your network. If you press the PS button while music is playing, you can start a game, the Internet Browser , or other applications while continuing to listen to the music in the background. While music is playing in the background, you can pause playback, adjust the volume, or change other settings on the screen that is displayed when you press and hold the PS button for at least 1 second. Background music is not included in video clips or broadcasts. Some languages are not supported in Media Player. For details on connection methods for media servers, refer to the instructions supplied with the device you use. It’s amazing, isn’t it? Now you can enjoy local videos on the PS4. Note: There are several options to play local media files on PS4. The Media Player has limited functionality but is very straightforward. For more advanced use cases, better compatibility, and in general if you have a huge movie library, you’ll want to give a try to a Media Server. As we know, the app mentioned above are all able to play various videos on PS4 without conversion. But sometimes you may get image lag and frame dropped when watching some HD videos (they are usually have a large file size). The fluency of playback depends on video decodes’ capability. If you encounter such a situation, or find some formats are unsupported by PS4 Media Player, you should turn to the solution 2. Read PS4 supported video and audio file formats and codec details from Sony PS4 product page. Video in H.264/AVC HP (High Profile) and audio in AAC LC(Low Complexity) format. Tip 2: We tried both MKV and AVI files to see if PS4 would play them. It did with no issues only thing is make sure you have your USB flash drive formatted fat32 or exfat and make a folder like videos to put your files in. Both FAT and exFAT formatted USB storage devices are supported. Be sure to fully insert the USB storage device into the USB port. In some cases, the device might not be compatible due to its shape or design. Depending on the state of the application or the system, playback might not be possible. It might not be possible to play some files due to their data type or file size. Some types of content distributed over the Internet and by other means have playback restrictions. For details, contact the content provider. Depending on the media server, you might not be able to play certain types of files or perform certain operations during playback. However, until now, there are many issues of playing Blu-ray/DVD on PS4 from PlayStation4 Support and forum. Maybe do some audio video setting could be on the cards to make them playable. But based on my own experiment, I directly have a shot on the last solution-rip Blu-ray and DVD movie on PS4 with friendly video format. It worked! Pls refer to the solution 2. You need the assistance of a hassle-free PS4 audio and video file conversion software program to seamlessly make any file fully compatible with the PS4. 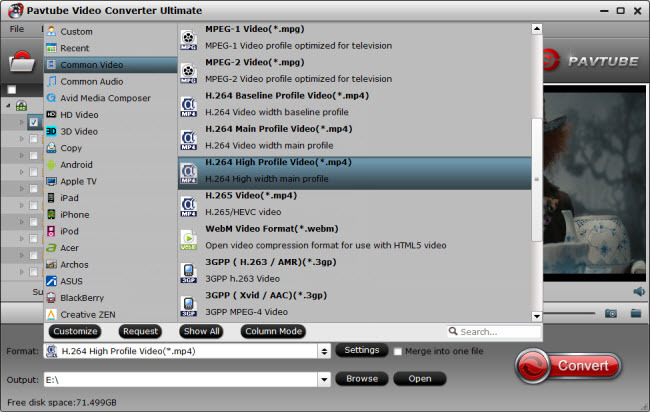 Here you can rely on Pavtube Video Converter Ultimate (See why we choose it), which is an all-in-one converting tool to rip Blu-ray, DVD and encode/re-encode all videos (MKV, AVI, VOB, MP4, H.265, Tivo, FLV, WMV, MPG, etc) to PS4 supported file format such as mp4 with the best quality and reduce the file size without quality loss. The software has a codec pack that enables conversion between different video and audio file formats. If you’re facing problems viewing your own media on the PS4, chances are you already installed this great utility. If not, download it below. Now refer to these steps below to get your movies and PS4 to play nicely. After the conversion is completed, transfer the converted videos to a USB drive that can be attached to PS4. Now you can enjoy your movies with PS4. 1. Transfer the converted movie file from your computer to the USB. You should format it to FAT-32 if you are using an external hard drive. 2. Insert the USB flash drive or hard drive into one USB port of PS4 console. 3. Turn the PS4 on after making sure there is a disk in the system, and then go to the main menu. 4. Select “Video” and then find your USB device. 5. Select “Display All” to see all the video files existing on your Sony PS4. 6. Select the file you wish to transfer and press the triangle button. 7. Choose “Copy” and confirm the transferring, then the movies are transferred and copied to your PS4 hard drive. 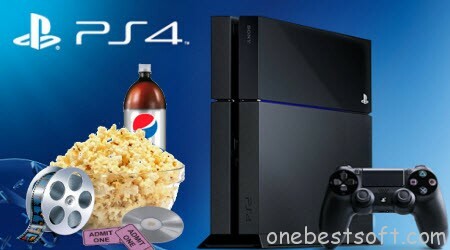 PlayStation 4 is thereby used as a host and a controller, through which you can play the HD movies on the display of computer monitor, video projector, digital television, or digital audio device with the help of HDMI or optical S/PDIF. Or you can use PS4 as a Media Streamer for streaming via Plex without DLNA. 1: Why PS3 can’t see my device? PS3 has a strict requirement for device format. The device you connect must be formatted to FAT32. 2: How to check if my device is formatted to FAT32? Plug your device in computer and check what letter the drive is. Open the properties dialog of that drive in Windows Explorer, and you will see the “File system” of that drive. 3. How to format my device to FAT32? Select “Run” from the menu in Windows and type “cmd” to bring up the command window. Type the following line in the window format (Drive Letter): /FS:FAT32. If your drive is K, and then you should type format K: /FS:FAT32. Besides iTunes DRM, it can also fast strip DRM from Amazon, BBC iPlayer, Zune, etc. Want to try this powerful app? Download the free trial version or buy it in bundle package: Video Converter Ultimate($65) + ChewTune($29) with Only $74.9 which can save you $19.1 to enjoy any DRM or common movies anywhere without any hassle!